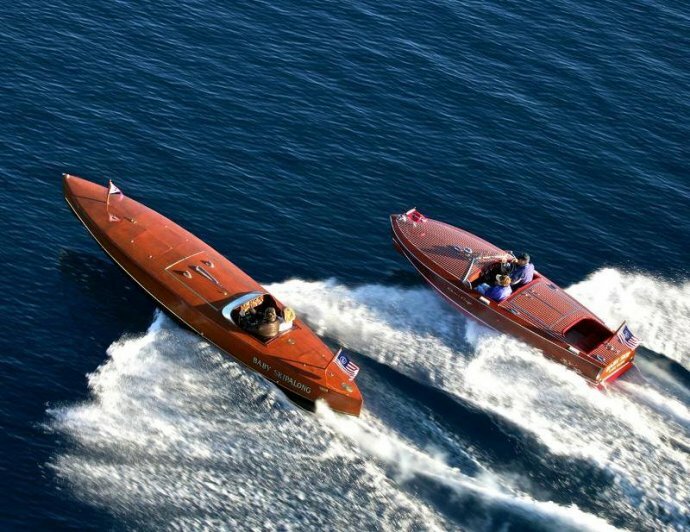 This year’s 46th annual Concours will again be staged at the historic Obexer’s Boat Company in Homewood, Calif., on Lake Tahoe’s beautiful West Shore with the two-day show open to the public on Friday, Aug. 10, and Saturday, Aug. 11. Concours Judges from throughout the United States will have already begun their work using the Foundation’s own nationally-acclaimed 100 point system and score sheet. Their collective goal: to reward those who have restored their boats to the highest level of authenticity and standard as they appeared when they were shipped from the factory. Because multiple first, second and third-place awards can be won in each class, each boat is judged on its own merit and only compared to other boats when selecting Perpetual awards. The Exhibitors’ Barbecue and Awards Presentation on Friday evening, Aug. 10, is just one of the social events surrounding the Concours. A gala Opening Night Dinner and Dance kicks off Wooden Boat Week, with a Men’s Grill, Ladies’ Luncheon and Fashion Show, and Woodie Over-The-Bottom following. All events are open to the public. As a special thank you to Concours Personal and Corporate Sponsors, there are special offerings including a VIP Lounge and parking at the show, and by-invitation-only Sponsor Dinner.